Precious metals futures dropped on Friday for a second straight session. For gold and silver, their sharp losses guaranteed weekly declines, their second in a row following four consecutive weeks of advances. Gold for April delivery on Friday shed $18.40, or 1.5%, to settle at $1,220.40 an ounce on the Comex division of the New York Mercantile Exchange. Strength in the U.S. dollar was among factors cited for precious metal losses. "We had a bit of a stronger than expected print on GDP, and it looks pretty decent in the headlines," Bart Melek, the head of commodity strategy at TD Securities in Toronto, said in a telephone interview according to Bloomberg News. "Gold adjusted modestly lower, and it probably also responded to the U.S. dollar." "This week, 1,428 people participated in Kitco’s online survey, of which 1,111 participants, or 78%, said they are bullish on gold next week. Sentiment was slightly higher compared to last week, which saw 71% bullish on the yellow metal. At the same time, 212 people, or 15%, said they are bearish on gold next week, and 105 people, or 7%, are neutral. A majority of market analysts also expect gold prices to move higher in the near term. Out of 34 market experts contacted, 18 responded, of which 10, or 56%, said they expect to see higher prices next week. Five professionals, or 28%, said they see lower prices, and three analysts, or 17%, are neutral on the market." Elsewhere on Friday, silver for May delivery slumped 48.5 cents, or 3.2%, to settle at $14.714 an ounce. Silver prices gave back 4.3% this week, trimming their gains so far this year to 6.6%. Last week, the precious metal slipped 2.6%. They rallied 6.9% the week before then. April platinum declined $11.90, or 1.3%, to $915.10 an ounce, falling 3.2% from its week ago level. Palladium for June delivery dipped $1.10, or 0.2%, to $482.45 an ounce, and dropped 3.3% on the week. For the year to date, platinum has climbed 2.5% while palladium has plummeted 14.2%. Gold fell $9.50, or 0.8%, to $1,226.50 an ounce. 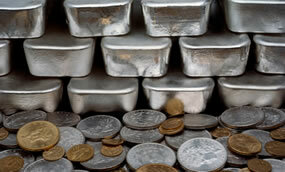 Silver added a penny, or less than 0.1%, to $15.17 an ounce. Platinum fell $2, or 0.2%, to $928 an ounce. Palladium added $5, or 1%, to $492 an ounce. For the week, losses totaled 0.4% for gold, 1.3% for silver, 1.4% for platinum and 3% for palladium. United States Mint bullion coins posted mixed performances from a week ago. Gold coin sales advanced 14,000 ounces compared to 28,500 ounces previously. Sales splits include 9,500 ounces in American Gold Eagles versus 22,000 ounces previously and 4,500 ounces in American Gold Buffalo coins compared to 6,500 ounces previously. Silver coin sales moved up by 1,223,500 ounces after rising by 926,500 ounces last week, with the latter total all American Silver Eagles. Splits this week included 1,073,500 ounces in Silver Eagles and 150,000 ounces in Shawnee National Forest Five Ounce Silver Bullion Coins. The U.S. Mint is rationing weekly sales of American Silver Eagles because of silver planchet shortages. This week’s allocation of 1,073,500 coins included 73,500 coins that were left over from last week. 2016 Silver Eagle sales are at 10 million, which is 17.7% higher than sales through the same time frame in record year 2015. Finally, cumulative sales of 2016 Shawnee National Forest Five Ounce Silver Bullion Coins reached 105,000 coins, the highest total since the 2011 Glacier National Park coin logged sales of 126,700 coins.